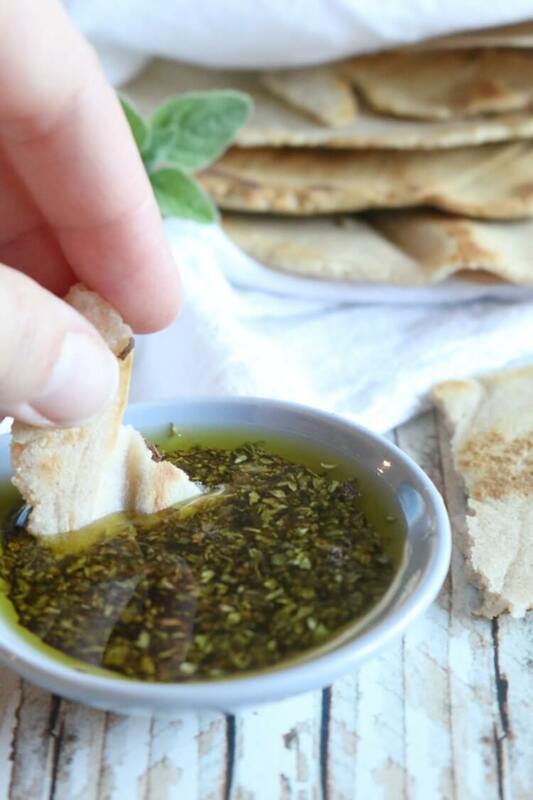 Bread dipped generously into healthy oil is a favorite appetizer for many. 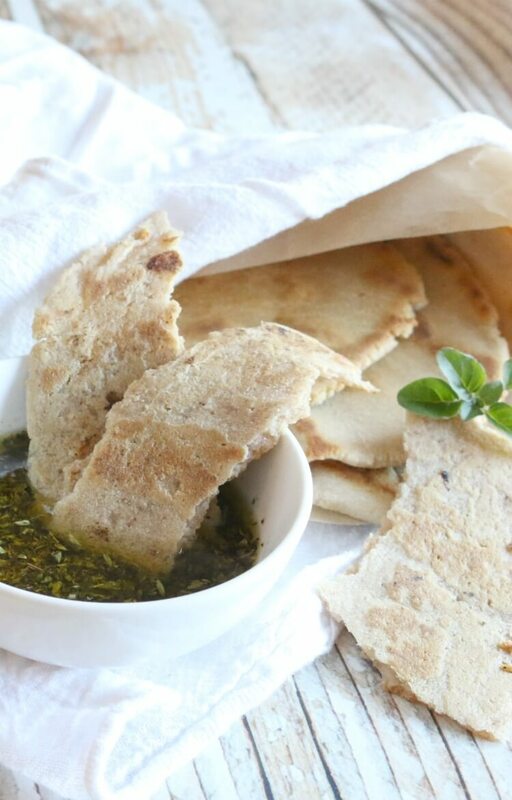 This gluten free flatbread with herb dipping oil is so tasty – you won’t miss the crackly baguette. 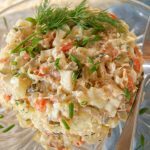 This post is sponsored by Olea Blue, all opinions, recipe and photography are my own. This post may contain affiliate links for your convenience. Thank you for supporting this site with purchases made through these links and supporting the companies I believe in. The information contained in this blog is not intended to be construed in any manner as medical advice. See full DISCLOSURE for details. 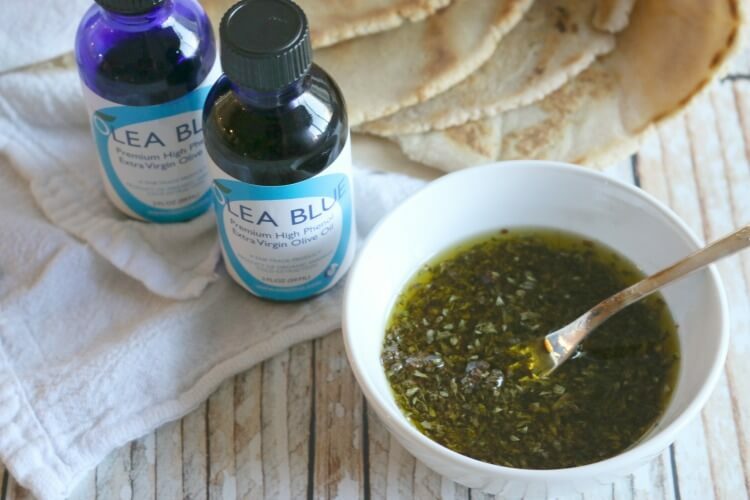 I’ve always enjoyed this unique appetizer of bread and dipping oil but it wasn’t until recently that I learned this dipping oil can be extremely nourishing when using a high quality oil. Extra virgin olive oil contains protective compounds but not all oils are created equal. Recent findings indicate some EVOO on the market is diluted with commercial oils such canola oil or soybean oil. When choosing olive oil, don’t let the label extra virgin olive oil fool you. Often times, it’s just a marketing ploy and as consumers, we must know the source and quality of the olive oil we are purchasing. What to look for in EVOO? Oleocanthal, is a high polyphenol compound that can be found in the purest form of olive oil. It is this compound that is responsible for the peppery sensation in the back of the throat when consuming oil. Interestingly, connoisseurs use an age old custom to rate high quality oils by taking a slurp and waiting for that burning sensation followed by cough. The reason for this unique practice is because sensor molecules found primarily in the throat latch on to these polyphenols causing one to cough. One cough, it’s good but three coughs is even better. Throughout lush communities in Greece, family owned farms use artisan techniques to produce an olive oil rich in polyphenols. This craft is passed down from generation to generation to ensure optimal harvest time in to protect rich properties and phenolic compounds found in their olives. Olea Blue extra virgin olive oil is unique because of its rich oleocanthal content. The stronger the phenolic potency in the oil, the higher the antioxidants. Like all antioxidants, polyphenols found in oleocanthal help protect cells from oxidative stress that can lead to premature aging and degenerative diseases. 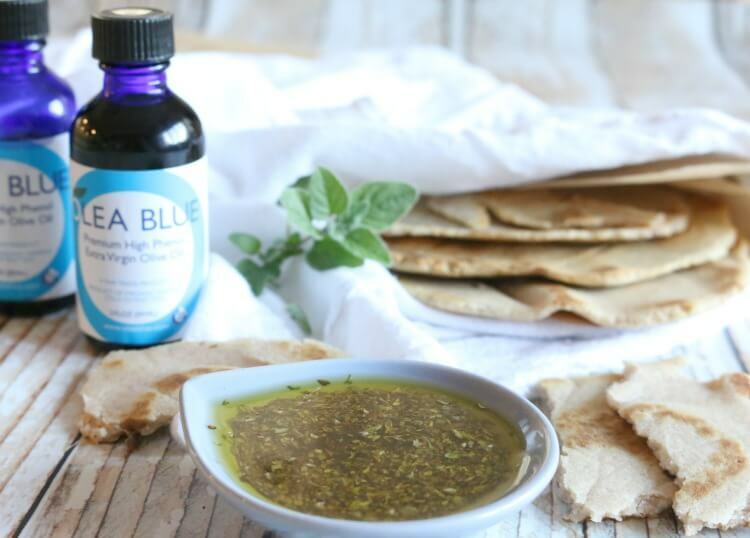 It’s worth mentioning that because Olea Blue extra virgin olive oil is potent with health protective compounds, it should never be heated. Instead, enjoy this oil in salads or in dipping oil (recipe below). The best way to tell if extra virgin olive oil has high levels of oleocanthal is by its taste. That peppery sensation on the back of your throat as mentioned is a primary indication of potency. The sharper, more tangy that sensation, the higher the level of oleocanthal. In addition to taste testing, Olea Blue also uses Nuclear Magnetic Resonance (NMR) to accurately measure phenolic compounds in their olive oil so rest assured you’re getting an exceptional product when choosing Olea Blue. Small mixing bowl to combine everything. Rolling pin to roll the dough between parchment paper. Don’t forget a good knife and butcher’s block to make that work easy! Cook those puppies on a cast iron skillet and use a spatula similar to this one to remove the baked goods. In a small mixing bowl, whisk yogurt and water together. Add dry ingredients and combine everything with a wooden spoon. Using hands, work the dough until fully combined and is soft and play-dough consistency. Note: If the dough is too dry, (not forming a ball and is flakey), add water by a tablespoon until the ball comes together. If it is too sticky (dough sticking to your hands), add cassava flour by a tablespoon until the ball comes together. It should be fairly easy and pliable to work with. Turn the ball of dough onto a cutting board. Using your palm, gently press into the ball to form a thick disk. Cut the disk of dough in half and crosswise in half to form 4 similar size pieces. 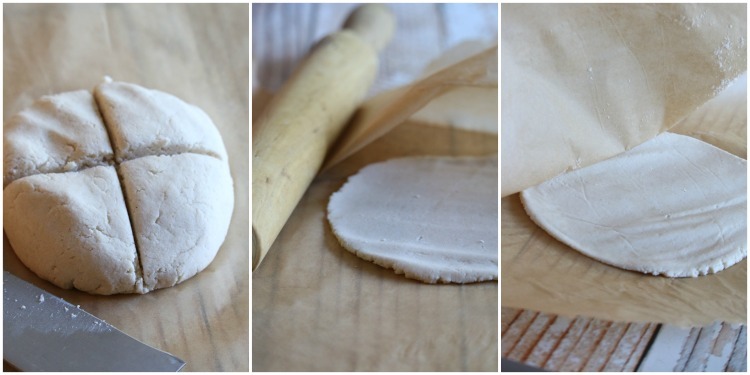 Working with one piece at a time, roll the dough between 2 pieces of parchment paper until you form a circular shape with slightly less than 1/4" thickness. You may need to flip the dough (keeping it between the paper) and roll on the other side. Carefully pull away the parchment paper from one side of the dough round. Shape the edges with fingers to form uniform rounds. Heat a medium cast iron skillet over medium heat. Place each flattened dough round on hot skillet and cook for about 3-4 minutes. Flip and continue to cook on the other side for another 2-3 minutes or until golden and cooked through. Transfer to a plate and cover with a clean kitchen towel. Repeat with remaining 3 balls of dough. Enjoy with dipping oil immediately or keep stored in airtight container for up to 5 days. Combine all ingredients and give a quick stir. Wonderful information about olive oil – thankyou. And the flatbread sounds lovely. Yes, I knew the importance of high quality olive oil but the oleocanthal compounds was new information to me. Enjoy the flatbread! 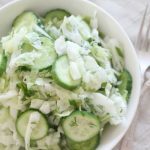 I’m recently gluten-free and this is my favorite appetizer. I’m so happy I don’t have to miss out now, great recipe. Turns out you don’t have to miss out on much if you’re gluten free. I’m so glad to see a gluten free flatbread. It looks great and I need to try this. Thanks for sharing about olive oil. Would love to dip this flatbread in some good olive oil. A good quality olive oil is so important. This looks so good! I know that this is probably intended to be served as an appetizer but would it be completely wrong to eat it as a meal? Yummy! Luci’s Morsels | fashion. food. frivolity. I couldn’t agree more about the importance of high-quality olive oil. The book “Real Food, Fake Food” really opened my eyes to some of these issues – in a shocking way! I’ve been much more discerning about the olive oil I buy since reading that, not to mention seafood, cheese, and other products. 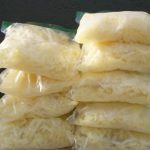 Thanks for sharing the info about oleocanthal – that is more detail than I previously knew, and super interesting! xo! 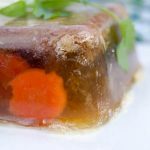 I found the information on oleocanthal fascinating. I’m intrigued about that book now – thanks for mentioning it. 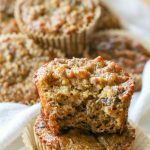 I love almond flour! 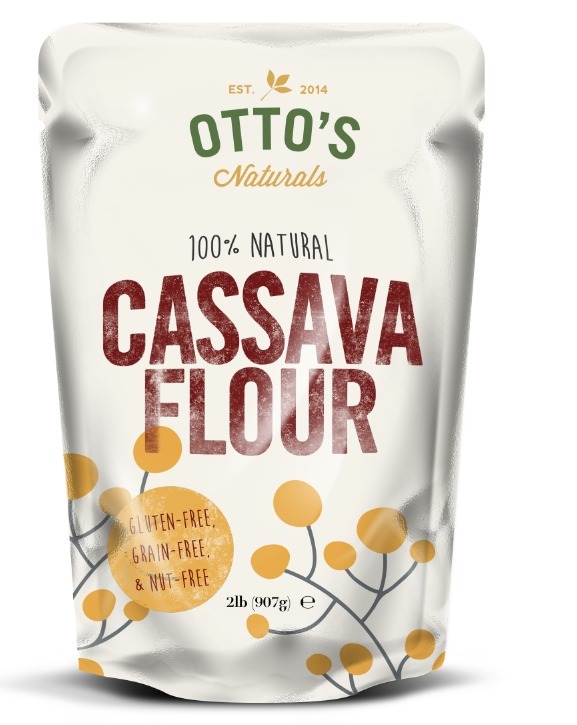 I haven’t used cassava flour so this is a must try. I love dipping my bread in a yummy sauce. Almond flour is good too but this one in particular uses cassava. It’s an amazing & versatile GF flour. Hope you get to try some soon. I absolutely love the sound of that herb dipping oil and yes, I am sure a good quality olive oil makes all the difference. This looks so good! I’m on my way over to your place to have some 😉 But seriously, that flatbread looks awesome and I’m a HUGE fan of dipping oil, but I never make it. 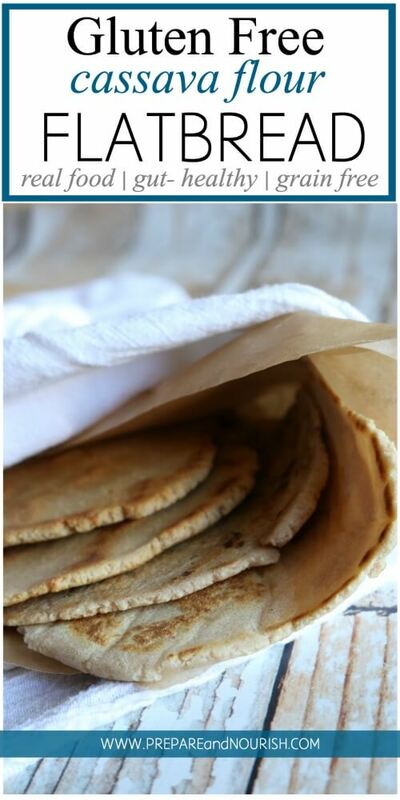 This looks so simple and easy to do, and especially wonderful with that beautiful healthy EVOO. I love that you use a combination of almond and cassava. I haven’t seen that before. It looks great! Great info on oleocanthal and olive oil, I’d never hear of the cough test! Isn’t it interesting? That cough test was pretty fascinating. Yay for gluten free flat bread! And that dipping sauce sounds to DIE FOR!!! The dipping oil is sooo good (and good for you!). 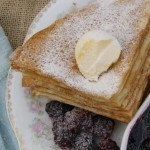 Anya, thank you for the great info on EVOO and this delicious recipe. I love that you combined cassava with almond flour. I can’t wait to try this! Thanks for sharing! Wow that bread looks amazing! 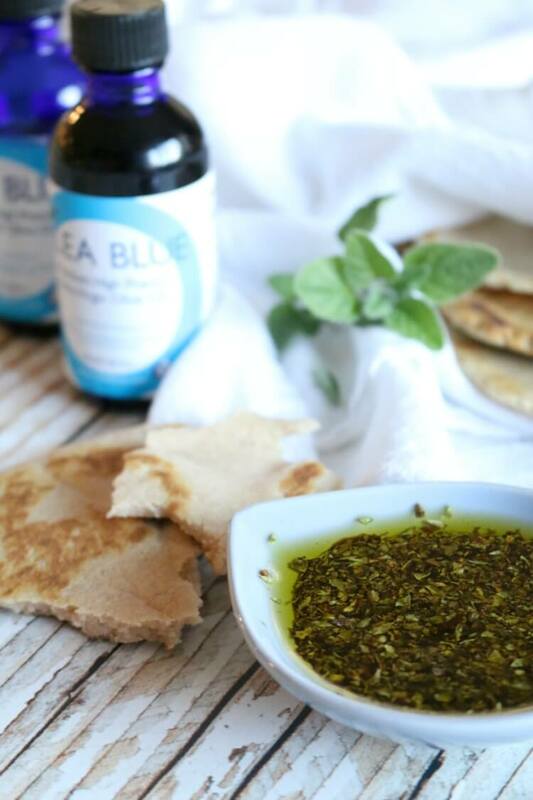 When I had my babies I would do bread and dipping oil in the afternoons for a pick me up! This brings back so many memories for me! 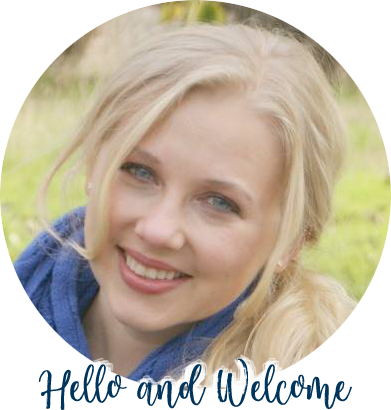 I love this bread idea – thank you for sharing! I love the look of this flat bead, I’m thinking it would work beautifully as a pizza base?! 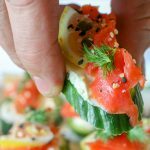 Great pics and my favorite style of eating with loads of different dips and spreads. I like your thinking, Donna. It would make superb thin crust pizza. Thank you Allison. Anything restaurant-style is great in my books. Flatbread is my fav! And this looks amazing. Like totally legit bread. I can’t wait to try it! Can’t wait to try this! 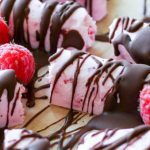 I have all the ingredients and so this lovely recipe is in my ‘sights’! You know me.. I’ll need to add a little herb here and there. lol. 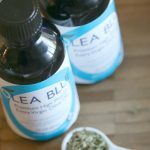 I always forget about dipping oils – this one sounds great! Thank you Dena. I love dipping oils. My husband always loved the bread and oil appetizer at restaurants so I know he will love this! This oil sounds amazing and I didn’t know all that info on how to tell if it’s pure. Thanks for the great recipe! Isn’t it amazing – that cough test! So cool! 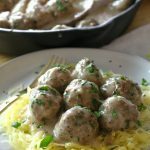 These look unbelievable, and I’m going to sent it over to my mom as well because we’ve both been looking for something like this – Thank you for such an awesome recipe! Oh bread with herbed sauce is my favorite way to snack… or it used to be. Thanks for paleo-fying this classic combo! Yum! Enjoy Cristina! I sure did miss this appetizer myself. Argh this is totally my favourite appetizer too! It KILLS me when I’m out eating with friends and they bring some of this over for the table. I can’t eat it so I just cry. The bread looks amazing too! Great job! Haha. I can relate to the eating out dilemma. Love gluten free flatbread. This is totally delicious ! This bread looks amazing and not too many ingredients, I used to love bread dipped in REAL olive oil it makes all the difference. Oh yes – olive oil can make or break the dip. So cool! Had no idea about oleocanthal!! Agreed. That bit on oleocanthal was so neat. There is nothing better than a good bread recipe. Thanks for sharing! 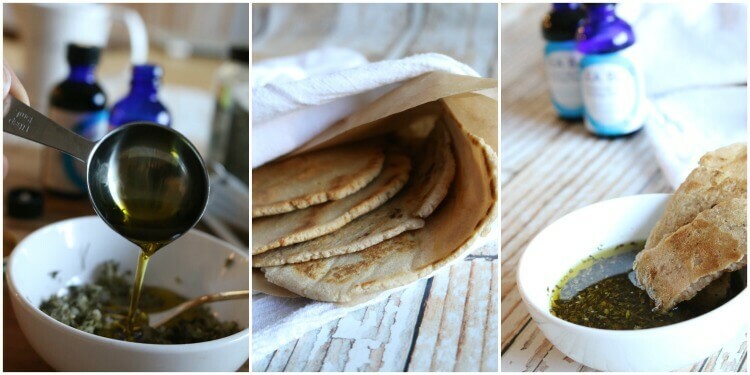 Hey Hun – Thanks for the lesson about EVOO and blessing us with this delicious flatbread recipe. I have been looking for a good EVOO, thanks for sharing, and the flatbread would be great for Gyros!! Thanks Holley. Yes these would be wonderful for gyros. Thank you Georgina. I loved reading that about the olive oil. Oh my gosh I used to loooove dipping bread in herbed oils before I found out I had celiac. I haven’t done it in so long and will definitely have to check this one out! I love Olea oil. Yummy. This gluten free bread looks fabulous! I would so dip it in that herb oil. Yum! Interesting read on the properties of the olive oil. We have spent some time in Greece and the food there is very natural. No processed food at all. A great way to enjoy with the flatbread. 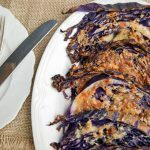 I’ve been looking for a recommendation on balsamic vinegar, so glad to see that tidbit included here! Yes! We love that balsamic vinegar.